Château de Chaintré is an ancient castle originally built in the twelfth century for the Chaintré family and now comprising a complex of buildings of varying dates (predominantly fifteenth and sixteenth centuries). From 1516, the estate underwent numerous changes in ownership. In the mid-nineteenth century, the property was acquired by the Society of Mary as a result of a bequest. A Marist novitiate and school were located here between 1845 and 1868. Although the castle is now a privately owned residential community, the perimeter may be walked around by visitors. 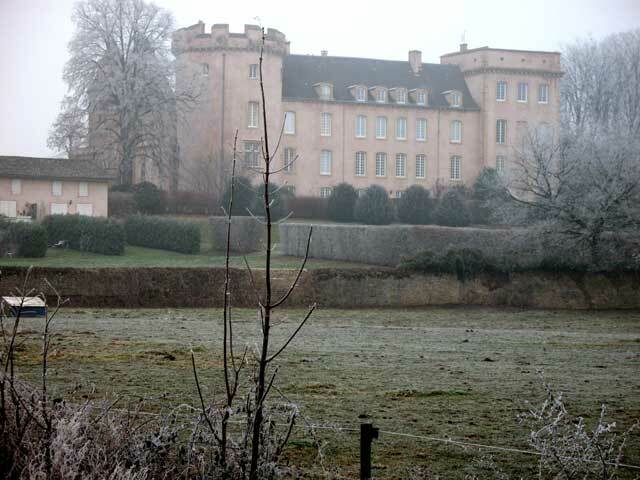 Towards the end of 1855, Eymard temporarily moved to the Marist novitiate property at Château de Chaintré, about 70 km north of Lyon. The purpose of this move was mainly to convalesce and to benefit from the peace and solitude of the place. As his health improved, he worked on the writing of a manual for the Third Order of Mary. Early in February 1856, the Marist Superior-General Fr Julien Favre (successor to Fr Jean-Claude Colin) agreed to personally present to the pope Eymard’s plans for a religious society dedicated to the Blessed Sacrament. ‘At Chaintré I prayed’, Eymard said. ‘Never have I prayed and suffered so much, begging God to make known his holy will’. On 22 April 1856, after his audience with the Pope Pius IX, Favre came to Chaintré to tell Eymard that ‘Rome’ did not approve of his project. Eymard immediately agreed to abide by what he understood from Favre was the pope’s decision. It was not until after further questioning of Favre, while walking the grounds at Chaintré, that Eymard slowly learned that Favre had only discussed the proposal with various church dignitaries, priests and advisers in Rome, and even a bishop, but not with the pope. It was on the basis of their views about releasing Eymard from the Marists that Eymard was told that ‘Rome’ did not approve. ‘For me, Rome is the Pope’, Eymard said. When Eymard pushed Favre to explain why his proposal was not presented before the pope, as promised, Favre said that he ‘forgot’. ‘It is finished’, he told Favre.